Over 400 cars turned out for the 2017 Old Fashioned Downtown Saturday Night event in Eaton. Sponsored by Downtown Eaton Inc., Eaton Police Association and Eaton Fire and EMS Association, the event helps close out the last weekend in August with a wide variety of vintage and “souped up” vehicles and motorcycles, good food, live music and family fun, as well door prizes and more for those who entered the car show. EATON — The 20th anniversary of the annual Old Fashioned Downtown Saturday Night car show zooms into Eaton this Saturday, Aug. 25, bringing with it hundreds of classic cars and bikes — and lots of vehicle and motorcycle aficionados. In 2017, over 400 vehicles registered. From 1-8 p.m., “souped up” cars and hot rod motorcycles will line the streets and fill the lots in downtown Eaton during this wheel-lovers’ extravaganza. Live music will be provided by two bands at the Preble County Courthouse square. The Preble County Art Association will be holding painting demonstrations. This year there will be a 50/50 raffle to donate the local Foodbank. Show awards will be presented at 8 p.m. This year’s event is again brought to Eaton courtesy Downtown Eaton, Inc., the Eaton Police Association, and the Eaton Fire & EMS Association. Grand prizes include a rebuilt small block engine, sponsored by Larkin Cobb Chevrolet Buick GMC and Advanced Professional (Car Quest,) built by Billy Moore; and a rebuilt transmission, sponsored by Bob Davis Transmission. Heindl Engineering is sponsoring the top 10 motorcycle awards and is sponsor of a $100 raffle for motorcycles only. 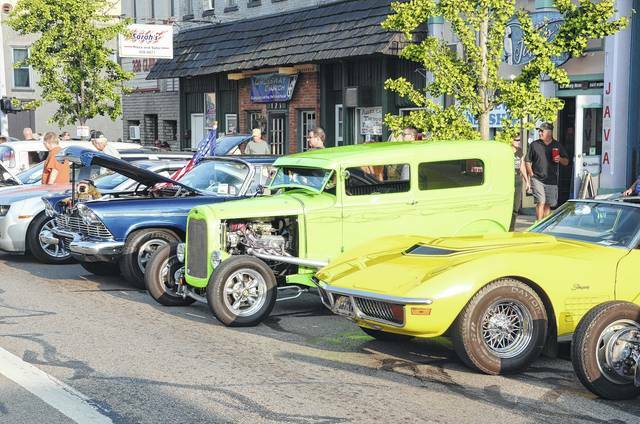 According to Eaton Police Department officials there will be no show cars allowed to park in the car show area until streets close at 1 p.m.
For additional information about Downtown Saturday Night or DEI, contact Chris Miley, 937-533-1081.
https://www.registerherald.com/wp-content/uploads/sites/41/2018/08/web1_carshow12_ne2018820143716140.jpgOver 400 cars turned out for the 2017 Old Fashioned Downtown Saturday Night event in Eaton. Sponsored by Downtown Eaton Inc., Eaton Police Association and Eaton Fire and EMS Association, the event helps close out the last weekend in August with a wide variety of vintage and “souped up” vehicles and motorcycles, good food, live music and family fun, as well door prizes and more for those who entered the car show.